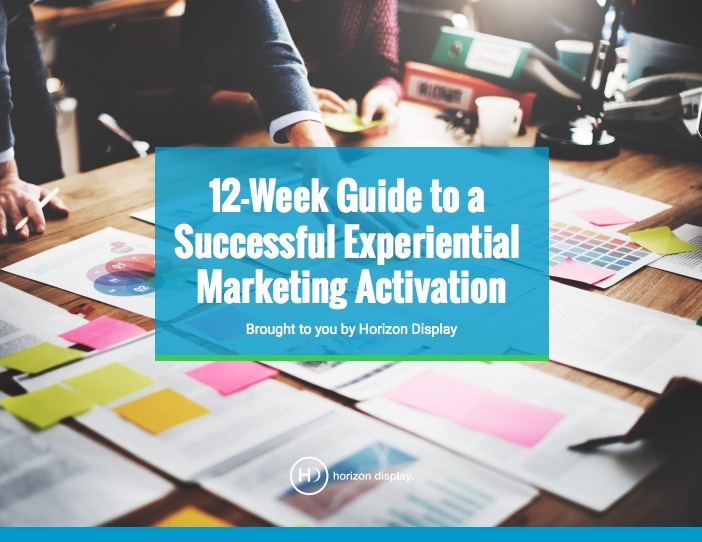 SAN CLEMENTE, CA--(Marketwired - March 21, 2017) - Horizon Display, an industry leader of interactive experiences and applications, announced today it is publishing a guide that provides a week-by-week plan for launching an experiential marketing campaign. The e-book, 12-Week Guide to a Successful Experiential Marketing Activation, is available for free download at http://info.horizondisplay.com/12-week-guide-to-a-successful-experiential-marketing-activation. "It won't matter how much runway you give yourself if you don't have a launch strategy," says Matthew Cutone, President/CEO of Horizon Display. "Each project is different, and so is the launch experience. Our new e-book presents a comprehensive plan, from initial steps all the way to launch week, so that marketers don't fall behind in turning an exciting concept into a successful campaign." Horizon Display believes that interactive technology is more than just a fad: It's at the precipice of a revolution in marketing, retail, and business on a global level. Horizon Display delivers extraordinary customer experiences and business results through interactive solutions. Our touch applications and interactive surfaces are designed for growing startups and national brands to improve their competitive advantage. We impress customers with an unexpected level of response, and we bring insight that helps them achieve their objectives. For more information, visit www.horizondisplay.com.